Jones the Grocer @Mandarin Gallery (Singapore) | Get Your Grub On! It was much more difficult than what I expected it to find something to eat on the first day of Chinese New Year. We ended up going to the Mandarin Gallery where thankfully Jones the Grocer was under the few places that were open that day. We were exceptionally lucky as well as even that all seats were taken we were the first in the queue and did get to try some wine and cheese whilst waiting. We started off with the “Duck Rillette” that came accompanied with baguette and pickled gherkins and onions. It tasted very delicate and had the right mixture of meat and fat without being greasy. For my main I went with their “Chicken Club Sandwich“. 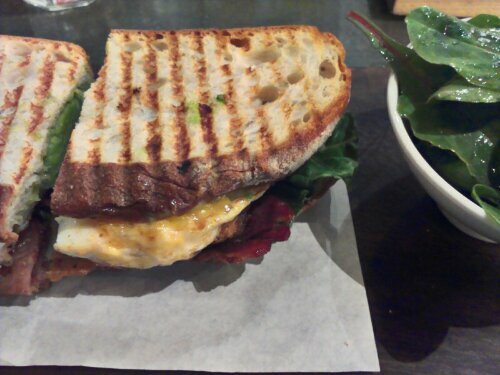 The bread was hearty and properly toasted, the chicken breast juicy and the lettuce and grilled bacon gave the sandwich a nice crunch and saltiness rounded up with a fried egg and creamy avocado. Super friendly service, good and quality food, I’ll be back; also to try their “Pulled Pork Sandwich” which unfortunately wasn’t available on the brunch menu.